Designed, initially at least, for the gaming market, the first virtual treadmill will allow gamers to physically play games in a totally unique way. 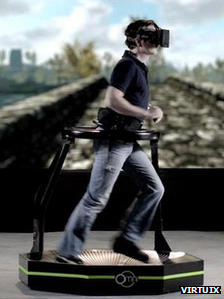 The Omni virtual treadmill lets you run, dodge, jump and walk through games. Consisting of A physical platform and matching shoes, the technology allows video gamers to control characters with their foot movements. It’s been backed like wild fire via crowd funding and will now go into production. Omni will use shoes fitted with sensors to track the motion and direction of the player. Made by a company called Virtuix, the Omni will offer the most immersive experience in computer gaming, allowing the player to ‘live the game’. In order to avoid accidents, the sensor fitted shoes include mini studs, which fit into grooves on the platforms base. the treadmill also includes a safety bar which contours the unit. The Texas based company launched the Omni on Kickstarter this week seeking $150,000 to initiate their project. The target was hit in three and a half hours, eventually raising $600,000 by the time of writing. The money is intended to turn their working prototype into a commercial model, with the intention of a January launch. This Microsoft Kinect powered super treadmill may actually have an application beyond computer gaming. The traditional gym market comes to mind. Gym goers find the treadmill to be one of the most effective pieces of gym equipment, but also one of the most boring. The Omni kit could transform this, bringing their immersive gaming experience to the fitness market. Virtuix says the platform’s low-friction curved base and radial grooves help players achieve a “natural gait”, while an upper-ring and belt mechanism prevent them from falling over. These are selling points in the fitness market too, where treadmills gave historically aggravated poor gaits and caused falling accidents. Next articleHas Google just killed the password?